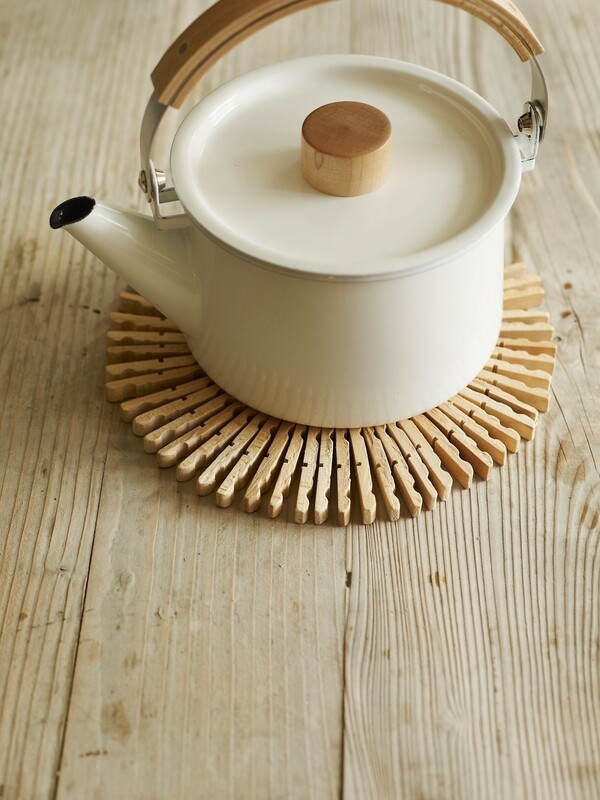 This trivet made of clothespins is a surefire conversation starter for your next afternoon tea. Posted by Houghton Mifflin Harcourt • Published 28th September 2014 • See Houghton Mifflin Harcourt's 13 projects » © 2019 Paul Lowe · Reproduced with permission. · Excerpted from SWEET PAUL EAT AND MAKE, © 2014 by Paul Lowe Einlyng. Reproduced by permission of Houghton Mifflin Harcourt. All rights reserved. Photography © Alexandra Grablewski. Using the Dremel tool, drill a small hole in each clothespin half about 1⁄2 inch from the tapered end. Thread the clothespin pieces onto the wire in the same direction until they form a circle. Once you have a full circle, wrap the ends of the wire together and twist until the clothespins are tight and secure.